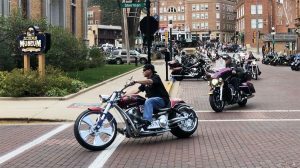 The Renewable Fuels Association’s new custom ethanol motorcycle, driven by RFA’s Robert White, took the lead in the 11th annual Legends Ride as part of the Sturgis Motorcycle Rally. The race this year was for the benefit of the Special Olympics South Dakota – Rapid City Flame and Sturgis Motorcycle Museum & Hall of Fame and RFA sponsors of the Ride. The Legends Ride® was created by the Sturgis Buffalo Chip® to raise significant funds for worthwhile charities in the Black Hills of South Dakota. Its goal is to positively impact local youth and preserve the rich heritage and history of motorcycling by uniting the motorcycle, music and entertainment industries, as well as riders from around the world.